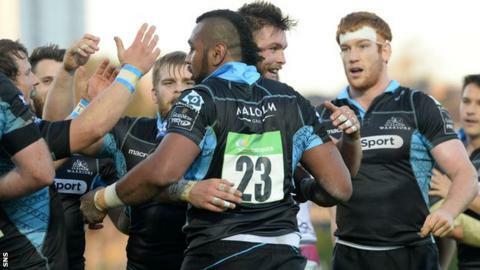 Head coach Gregor Townsend is confident Glasgow Warriors can go far in this season's European Rugby Champions Cup. The Pro12 champions open their European campaign away to French side Racing 92 on Saturday. Northampton Saints and Scarlets are also in Pool 3 and meet at Franklin's Gardens later on Saturday. "We certainly have a playing group I believe can get to the latter stages of the Champions Cup," Townsend told BBC Scotland. "We are playing a team we don't know much about but we know who they've got in their roster and they are very strong. "They have played eight or nine games this season and we've had a good look at them. "We know that, if we can put our game in place, both defensively and in attack, it's going to cause any team problems." Townsend described Northampton as "one of the strongest teams in England over the last 10 years" and Welsh side Scarlets as "the form team in [Pro12]". "All three teams are going to be threats," he said. The Warriors did not progress from the pool stage in last season's inaugural Champions Cup tournament and Townsend warned that his side must play to their full potential throughout. "You've got to play very well, close to your best, for the six games," Townsend said. "Last year, we won against Bath and Montpellier, but it wasn't good enough as we only won one more match after that. "We've had more experiences of winning big games [since then] - winning the semi-final and final in the Pro12. "Our players, most of them that are going to be involved this weekend, have played in the World Cup. So they have had excellent experiences since they last played in the Champions Cup, but it's how we play right from the start."